If you've never been fond of your penmanship, free handwriting instructional fonts may give you the confidence you need to begin including handwritten journaling on your scrapbooking projects. Computers are fabulous tools for busy scrapbookers because they make it easy to find clip art, quotes, page titles, and layout ideas. When it comes to journaling, however, you may want to consider giving your computer a rest. Formatting journaling using free fonts on your computer results in layouts with a neat and clean feel. Unfortunately, it also takes away from the personalized look of your project. Your handwriting is distinctive and offers a valuable glimpse into your life. Even if your penmanship isn't perfect, your family will be thrilled to see your words handwritten on your layouts instead of simply typed in an ordinary font. Once you become comfortable with the concept, handwritten journaling can even be a great timesaver. If you keep a pen and journaling cards in your purse, you'll be ready to jot down thoughts for your layouts at a moment's notice. When you're ready to scrapbook, all you'll need to do is glue the card into the appropriate spot. Print Clearly is a simple and easy to read font that can help you learn to write uniform looking letters. Manuscript is basic block lettering with a slight slant. La El 2 is the traditional cursive writing that looks very much like what is taught in most elementary schools. Learning Curve is a cursive font with a light and airy look. The LoveToKnow Scrapbooking article on Download Free Cursive Handwriting Fonts has a number of font suggestions for you to review as well. Don't slouch! Posture is surprisingly important when it comes to practicing your penmanship. If you're slumped over in your chair, your handwriting will suffer dramatically. Make sure you're letting your shoulders and forearms do most of the work when you write. 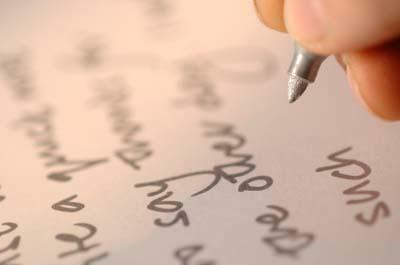 People with poor handwriting tend to put the full weight of their hand on the paper and use their fingers to form the letters. They pick the hand up repeatedly to move it across the paper-creating a tight, cramped lettering style. Choose a writing instrument that's comfortable. For scrapbooking, you'll want to write your journaling using a pen that has archival quality ink. Beyond that, however, you have many different choices. Take a trip to your nearest stationary shop and spend some time practicing with a variety of pens to get a feel for what suits your writing style the best. When you see someone who has handwriting you admire, take the time to analyze what it is you like about their unique lettering style. Do you like the spacing between words, the slant of the letters, or the consistency from line to line? Knowing what types of handwriting you find most attractive will give you the insight you need to improve your own penmanship. Consider taking a class in calligraphy. Although many people associated this fancy lettering with wedding invitations, learning calligraphy basics will improve your everyday penmanship as well.